As the first black British female solo artist to have 6 consecutive Top 10 / 20 hits, Jaki Graham firmly maintains her position as Britain’s most revered queen of soul with the release of her long awaited new studio album When a Woman Loves. Mastered at Abbey Road Studios and brought to you by Absolute Label Services, When a Woman Loves is the beautiful result of Jaki’s personal and at times challenging life journey, highlighting her resilience and strength of character. With song contributions from Michael McDonald (Through The Rain, Someone Like You and Song Inside Me), Eric Benet (News For You) and the late Maurice White of Earth, Wind and Fire (Eye To Eye), the album is an exciting celebration of Jaki’s 40+ years in the business. On each listen you can’t help but discover something new, whether embedded deep within the music or simply with those subtle background harmonies, but either way as soon as the album has finished you can happily have it on repeat and immediately listen all over again. The solid foundations on which this has been produced is honest and authentic and almost leaves you with a sense of familiarity, as it takes you back to a time where music truly was music, came from the heart and was there for all to be enjoyed. 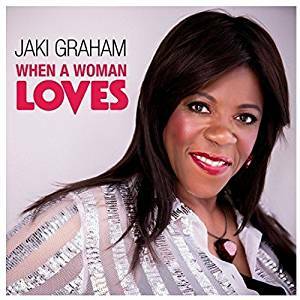 When a Woman Loves is an exquisite testament to Jaki’s timeless artistry and professional growth and proof that Jaki Graham still shows us all how it’s done!